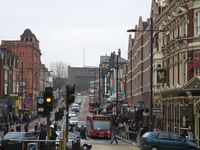 One Clapham Junction development I am allowed to talk about are the council’s plans to improve the area around the road junction. Anyone who knows the area will know the junction of Lavender Hill, St John’s Hill, St John’s Road and Falcon Road is something of a mess. Visually, it’s full of clutter, and it just doesn’t work that well as a junction for traffic or pedestrians. Tonight’s Planning and Transportation Overview and Scrutiny Committee will, hopefully, be passing a report to make a start on improvements. The overall scheme, which has been in development since 2007, it too expensive for the council to undertake alone, but elements of it can be done. The suggestion is to look at the ‘traffic management’ since, by improving the way vehicles move through the junction it will improve the quality for all users, including pedestrians – and most importantly improve safety. Drivers will get a better junction to traverse, and some may be able to avoid it altogether, with a right turn now being allowed onto Falcon Lane (past Asda). 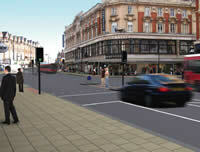 Pedestrians will benefit from wider pavements and better crossings. And everyone will benefit from a visual improvement, with a much cleaner and more attractive gateway to one of our busiest town centres.